Happy Chinese or KuaiLe HanYu is a complete learning program specifically created for teaching beginning Chinese to students 6 years old and above. The program includes three levels. Each student’s book has 24 lessons grouped into eight units. Each level contains a student's text book, audio CDs, workbook and teacher's hand book. The text's colorful illustrations add meaningful context to words and situations to make each lesson appealing to young students. In simplified Chinese characters, Pinyin, and English. 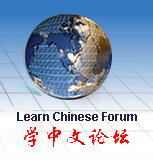 Great for young students, age 6 and up, to learn Chinese as a foreign language from the beginners level.